We have a design for the new Mother Goose building that looks remarkably like the old Goose, but has significant improvements in space, access, and environmental greenness. That design is now in front of the Atlanta Urban Design Commission and we are working with the Commission to secure its approval. The new Goose will have the same footprint as the old Goose, but the much-needed improvements will benefit the school for decades to come. We are anxious to share these plans as soon as the AUDC approves them. It will be evident what a big difference the enhanced Goose will make school-wide, not just in the high school. It was, as they say, a no-brainer for the board of trustees to decide both to replace the building and do so in a manner consistent with Paideia's longer term space needs. We are still working intensely with the insurance company to arrive at a fair cost for the building we lost. Paideia has replacement insurance, but that is insurance for residential construction with none of the necessary and desirable features of a new building that will work for the school. We are hopeful that these negotiations will be completed soon so that another variable in the financial equation of the overall cost of this project will be fixed. The building committee is working feverishly with architects and our builder to get a firm price of the new Goose. Our goal is to begin construction in the late spring or early summer and open the building seven months or so later. We will begin the renovation of Python Hall, the last phase of The Campaign for All Ages, the day after school ends in June. We expect that there will be economies of scale having two projects going at the same time. The downstairs of Python will be finished by the start of school; the second floor, six to eight weeks later. The gap between what we will likely get from insurance and the estimated costs of the enhanced Goose will probably be in the $2 million range. We will need to raise that money, and begin to do so relatively soon. We have already approached some of the major foundations in the city. There is no other choice but to re-build: the school cannot do without the space; it would be foolishly shortsighted not to take advantage of this building footprint on a land-locked campus and improve life for everyone for years to come. In the best of all worlds, the Goose would not have burned down, or if it did, it would have burned down even longer after the completion of the capital campaign that ended two years ago, or in more settled economic times. But life happened, so our plans had to change. The timing is not great, but despite the loss of an iconic building and the inconvenient pain of the past months and next few months, we will come out of this in better shape than we were before. A lot of people are working very hard to hurry this along. I hope to be able to report much more very soon. That's my plan, and at the moment, this is my life. It's not exclusively an "Atlanta" thing, but apparently empty, foreclosed or "spec" McMansions up in the North Fulton 'burbs are being used as party houses. Promoters find big, unsold blingy houses and then sell $20 tickets to one night bashes, even hiring buses to transport party goers to the venue. College students are targeted by the party promoters. Police say this house on Powers Ferry Road in Sandy Springs was where an illegal Halloween party with up to 1,000 people took place. The home appears to have been recently built. "It was the biggest party I've ever seen," said Kathy Battaglia, who lives across the street. "There were cars parked on both sides of the street, buses going back and forth. And there were probably more people outside the house than inside. The noise was unbelievable." The crowd consisted mostly of students from Georgia State and West Georgia universities, where the party was heavily promoted. Fliers hinted at an MTV-esque ode to material excess, minus the flamboyant celebrities or spoiled Sweet 16 birthday girls. The $20 admission didn't cover alcohol, sold inside without the necessary permits. In an interesting twist, Brian Epps, the brother of arrested party promoter Anthony Epps, is Rockdale County sheriff's Sgt, one of two local law enforcement officers hired to provide security. Sgt. Epps is currently on administrative leave, and Anthony spent a night in jail, but only faces a misdemeanor charge of disorderly conduct because he had the owner's permission to hold the party. On the other hand, Epps grossed $20,000 for the party. The URL for Antico Pizza Napoletano really is the giveaway. The web address is www.anticopizza.it Not .com, not .net, but .it for Italy. Every ingredient but the water used to make the dough -- the flour, San Marzano tomatoes, olive oil, bufala mozzarella, down to a particular kind of sea salt -- is sourced in Italy. Naples, to be precise. So I headed all the way across town to Antico Pizza with my boys last night and with high hopes. We are New Yorkers, born and bred on great pizza and happy converts to coal-fired pizza joints over the years. Our Long Island pizza palace par excellence was Port Washington's own Salvatores Coal Oven Pizza whose brazen motto is: "No slices, no credit cards, no cry babies!" The reviews for Atlanta's newest coal-fired pizza place, Antico, have been so glowing that I told the kids we probably needed a back-up plan in case we couldn't get a table. Turns out, there are no tables at Antico, at least not in the conventional sense. What there is is a big wooden communal table (without chairs) where you can stand and eat your pizza, which is what a middle aged foodie type couple were doing when we got there. This is coal-fired takeout at the very highest level, and it is a joy! I will not rip off any more of the Blissful Glutton's (aka Jennifer Zyman) luscious photos of the actual pizzas, ovens and ambiance, but you can see them here. We ordered a pizza margherita and a cheese calzone, both of which came out of the oven very fast, (apparently the ovens reach temperatures up to 1000 degrees, which means the pizzas cook in 60 seconds or less) were speedily sliced and beautifully boxed to go. If we had any teeny tiny gripes about the food, it was when we got home (about 7 miles away) we ate the calzone first -- it is ginormous, by the way, and fed three generously. So by the time we tucked into the pizza it was not piping hot, but still fabulous. I have no adequate words for the luscious, creamy calzone. The cheese was sublime, the crust was heaven. Nothing I've previously eaten by the name of calzone ever tasted this good. Don't miss it! Luca Varuni, our counterman last night, is passionate about pizza. Everything about Antico is a love poem to authentic Naples-style pizza, from smoky and slightly blackened crust to the sweetness of the tomatoes. But wait, there's more! Antico offers incredible Italian dessert. Not merely crispy cannoli shells that don't get filled until you order them so they don't get soggy, but . . . be still my heart . . . SFOGLIATELLE which are flown in from Naples. Sfogliatelle ("Sfoyadel" as New York Italians say it) is my favorite Italian pastry of all time. Sfogliatelle are shell-shaped, with a crispy mille feuille crust and an inside that's soft and sweet, with sweetened ricotta, semolina and sometimes a bit of citron or candied orange. They are very labor intensive, and when a bakery gets it right, it is a taste of paradise. Antico's are awesome, and they come with a free cup of espresso. I haven't been to Varasano's yet but honestly, why would I need to when there's Antico with the adorable Luca behind the counter? The steady thrum of rain and the crashing in the heavens has been our soundtrack this past week. An astonishing amount of rain has fallen...20 inches in 3 days! Lake Lanier, once scarily dry, picked up more than a foot yesterday alone. We're doing pretty OK intown, but there's a lake on North Avenue behind City Hall East, Medlock Park has flooded, DeFoors Avenue is really bad, and the Downtown Connector was flooded yesterday during rush hour. The really serious problems are in the suburbs where unbridled development in lowlands and near streams has closed roads and entire subdivisions, and flooded the highways. There was a mudslide too. Yup, let me add my voice to the rave reviews: Morellis is absolutely worth the trip down Moreland Avenue to East Atlanta. G-man and I ventured down to Morellis on Friday night. We both opted for waffle cones -- Bordeaux Cherry Chocolate for Gabe and the Ginger-Lavender for me. Sublime! And the vibe is great too -- families, kiddies in PJ's, geeks, freaks, the full tilt East Atlanta/Ormewood experience. Next time I'll forgo the waffle cone and just have my ice cream in a cup. Though the texture and crunch of a waffle cone is great, I'm not a sweet freak and for me the cone gunks up the pure flavor of the ice cream. Flavors, did you ask? Oh man, the signature flavor look amazing and we'll have to keep coming back to sample them one by one. A blow to the Briarcliff/Clifton Corridor, where big changes and big development is coming. 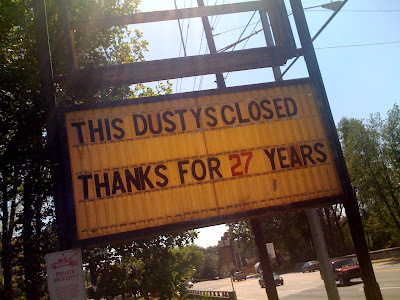 Sadly more closures in the local restaurant scene as Dusty's BBQ near Emory closed today. Open for 27 years at the corner of Clifton and Briarcliff Roads, the restaurant is said to be continuing operations as a catering only business at a different off site location: Dusty's Catering 215 Laredo Drive Decatur, GA 30030. Repeat Atlanta is not sure if this was a planned closure, but they certainly got their signage down fast. The eatery served their last meal yesterday and by this morning signs were down and moving trucks were picking up equipment, presumably for the catering business. Repeat Atlanta! It's lovely to live in a city with trees . . . until they start falling left and right. That's what's been happening all over Atlanta after every rainstorm. It's the bitter harvest of 3 years of severe drought that has weakened root systems and sickened our majestic trees. These giants don't even need a wind to topple over, just a good drenching rain. 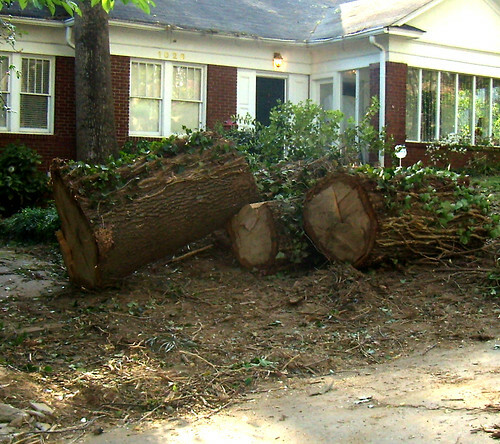 Gabe and I saw at least 4 more major tree falls on the way to school this morning, all in Druid Hills. The scale of these trees is mammoth. They're almost like dinosaurs when they fall. Their roots have rotted from the stress of too little water. A big rain softens the surrounding soil, and boom, they go down. Here's the tree that keeps me up at night. It's that giant to the left of my house, right outside my bedroom window. It provides glorious shade in Atlanta summers, but it scares the you know what out of me. After seeing so many behemoths fall in the neighborhood, I'm scared. The cool freakishly cold weather we've been having has been a blessing to the rare lilac bushes one occasionally stumbles upon in Atlanta. I have been known to slam on the brakes and then ring doorbells for permission to "sniff" a lilac bush in Spring. My children are appalled. Those who lust for lilacs will understand. Zone 7 is just not hospitable to lilacs. They tolerate Zone 2 in the northern reaches of New England, (think Robert Frost..."when lilacs last in the dooryard bloomed...") but Zones 3-6 are the best. Atlanta's Zone 7 is really pushing it. The lilacs at the Atlanta Botanical Garden have no smell at all -- I believe they are hybrids. Pretty, but missing that essential heavenly scent. Well, I found a lilac bush today along the fence in the parking lot behind Mary Macs Tearoom. Real lilacs, nice red-purple color, with a real scent. I stood there sniffing and smiling, wondering how my lilacs are doing in all my former homes up north.